Savina by Bosa Finally Releases Their Penthouse Series! Typically, penthouse level homes in Bosa buildings are finished very similarly to the other residences. With the penthouse line, they typically have larger floor plans, less homes per floor, and of course, amazing views. The finishes tend to feature the same kitchens, bathrooms, flooring, and window coverings. In Savina, they decided to take the penthouse residences to a different level. These exquisite homes are only offered on floors 35 and 36, which limits the options to just 4 homes per floor, 2 of each plan, and only 8 total in the penthouse series. The 8 residences have an upgraded appliance package, which includes all Gaggenau kitchen appliances as well as a full height Thermador wine fridge. They also include a smart home system including an ELAN touchpad and MechoShade motorized window treatments. 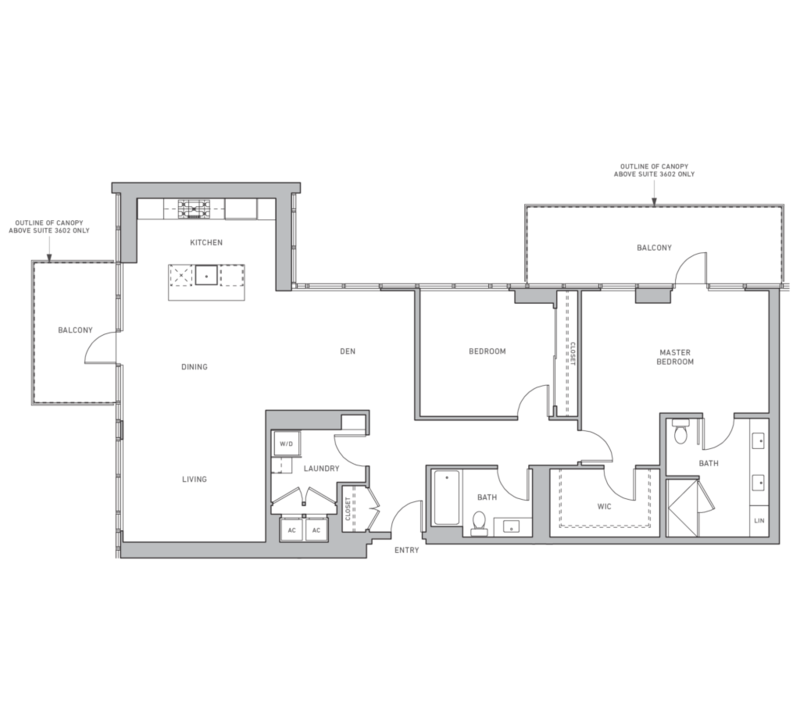 Three of the four penthouse plans also include a laundry room. Each penthouse residence also comes with 3 parking spaces! 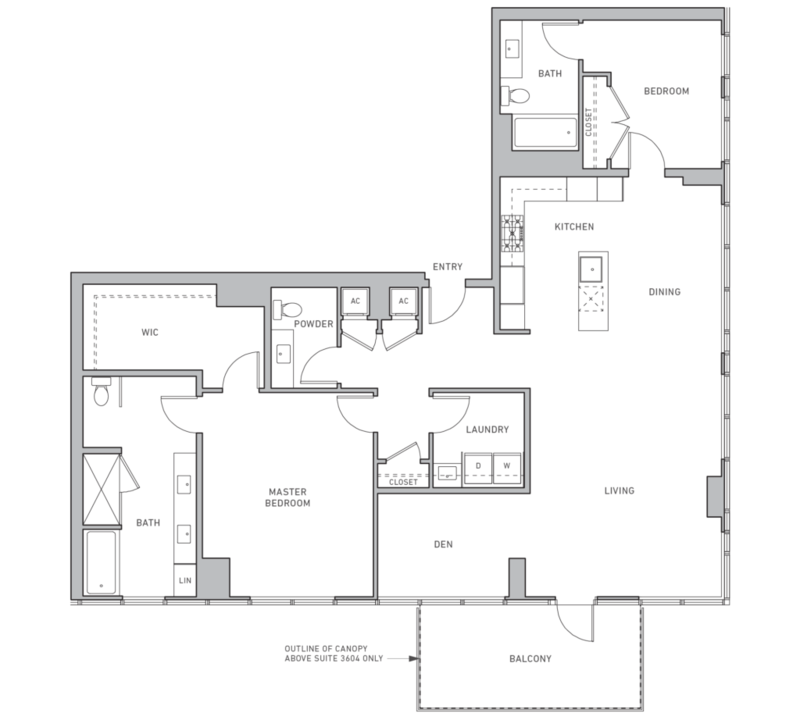 The penthouse series range in size between 1,715 square feet to 2,334 square feet. They start from $2,189,900 and go up to $3,599,900 depending on size, orientation and whether the residence is on the 35th or 36th floor. On top of the the fact that the 36th floor is a little higher up and doesn’t have a neighbor above, the ceiling heights are approximately 1 foot higher than average, which make these homes special. The increased ceiling heights will make these homes feel even more spacious. If you are interested in learning more about these amazing homes, feel free to sign up on the contact form in this page or call me at (619) 228-6790 to arrange your meeting. I would love to discuss what you are looking for, where I personally think the most value is, and how you can proceed. You can also find more information on the building by clicking here. Join Our VIP New Condos Interest List! 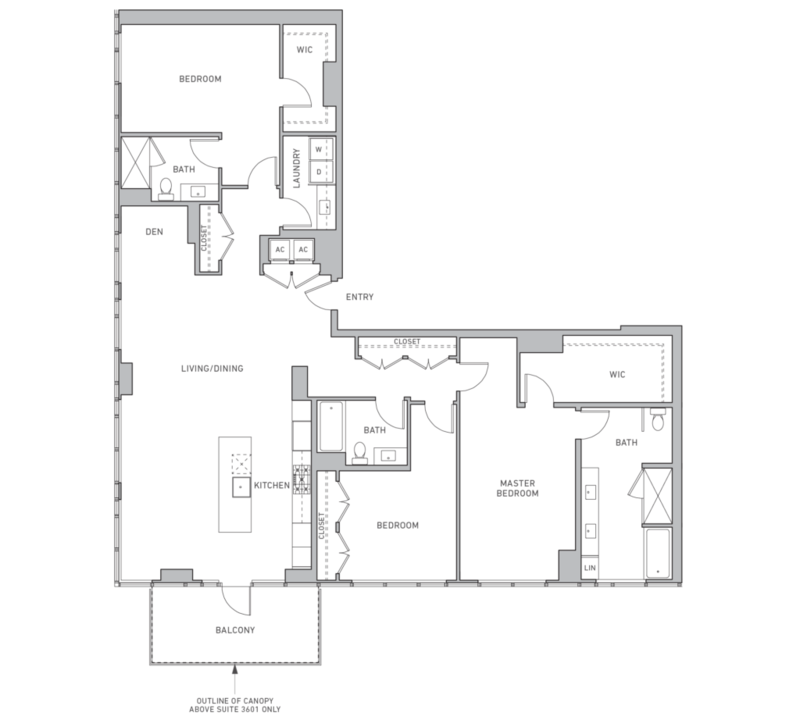 What I like – This is the only 3 bedroom plan in the tower. The view from every room of this residence will be spectacular. These are the highest priced homes in the building, but they are also the largest penthouse residences. Due to the location and orientation they are very private and the panoramic views will be stunning. There is also quite a bit of storage in these homes, which we all know is an adjustment if you don’t already live downtown. 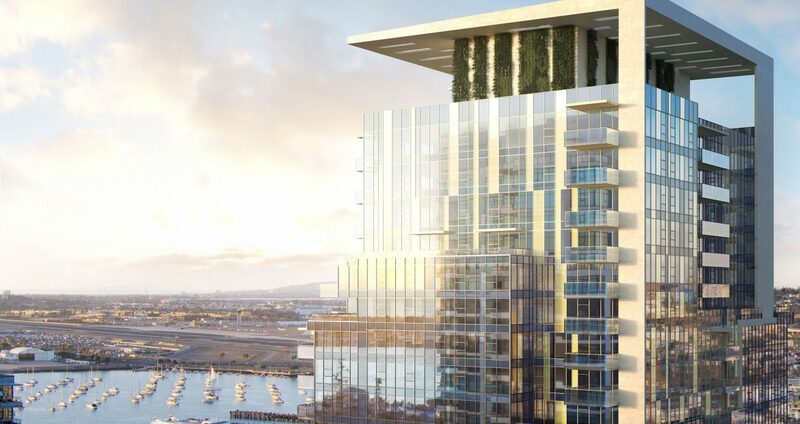 What I like – There is a balcony on the north side of the residence, which will have amazing views of the bay, city and airplanes coming in. Additionally, there is a large balcony on the east side of the residence off of the master bedroom, which is perfect for soaking up the morning sun with a cup of coffee or gazing out over the city in the evening. Also, the living area is a great layout and has ample wall space, which is often forgotten when looking at floor plans. What I like – This layout is perfect for someone who wants natural light in the living space. There are 9 south facing windows and 3 east facing, which will be great morning and afternoon light, but you won’t burn up during sunset. This orientation also offers the best city views in the building. If you haven’t seen the city at night, it is definitely one of the most underrated views. I also like the formal entry on this plan. What I like – This is my favorite penthouse plan. First off, the living/dining layout is really functional and the combination between the city and bay views are the best in my opinion. 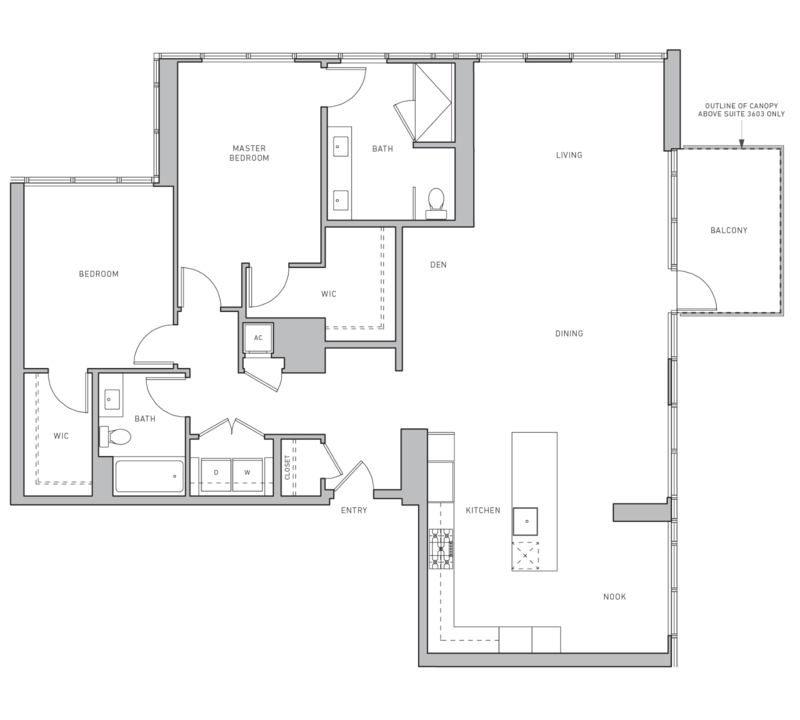 The master suite is very large and I like that the 2nd bedroom is on the opposite side of the floor plan. This layout also has one of the largest master en suites in the building. Overall, I think this plan is going to not only have the most stunning views, but will be the best value in the penthouse series. Broker is not a direct representative of Bosa Development CA II, Inc. Bosa is not liable for any modification or misrepresentation of the product offering. If you are interested in an early opportunity to purchase or if you would like to remain updated as things progress, please contact me at (619) 228-6790 or Ryan@livingthesandiegolife.com. Sales Will Start Soon! Give Me A Call Or Sign Up On Our VIP Interest List Today!